Our love for plastic and our throwaway culture is choking our oceans and wildlife, but it doesn’t have to be this way. Covering 71 per cent of the Earth’s surface and deeper in places than Mount Everest is tall, oceans have long been a source of fascination. Since Captain Cook charted the Pacific Ocean in the 18th century, returning with zoological specimens and botanical artwork that set the mark for scientific exploration, we have been learning about the natural world. Scientists are still discovering new species. Researchers and filmmakers travel to the most inhospitable places revealing the ocean’s mysteries in documentaries such as Blue Planet. But sadly, today’s naturalists are faced with the impact of ocean plastic waste. Watching albatross parents feed plastic to chicks has been one of the lows of David Attenborough’s natural history career. But how did we reach this point and what can we do to help regenerate our oceans? The first polymers were volatile and plastic items were made by hand, but by the 1940s, new polymers were being mass produced by machines, increasing production speed and bringing down costs. Plastic was soon used to make everything from toothbrushes to aeroplanes. Polystyrene, polythene, polyester, nylon and Teflon became household names in a plastic revolution. Plastic technology has provided widespread lifestyle benefits. Globalisation has opened up cheaper labour markets that produce cheaper products, allowing people on low incomes to become consumers, thereby creating a more equal society. But access to cheaper products has caused overconsumption and a throwaway culture. Where we used to repair, now we discard and replace. How does plastic waste end up in our oceans? There is a plastic solution for every storage problem, but cheap plastic is brittle. One crack creates more landfill. Single-use plastic packaging and disposable tableware, such as bottles, cups, cutlery and straws, have an even shorter usable life. Carried by storm water, winds, rivers and tides, plastic waste travels from land out to sea. Countries without adequate waste management services in areas of dense populations are the main sources of plastic waste reaching the sea via rivers. Even countries with good waste management services are not in the clear. In the UK, the household waste recycling rate dropped from 44.8 per cent in 2014 to 43.9 per cent in 2015. What is the impact of plastic waste? Remote islands are littered with our waste as plastic debris is caught in ocean gyres and washed up on once pristine beaches. 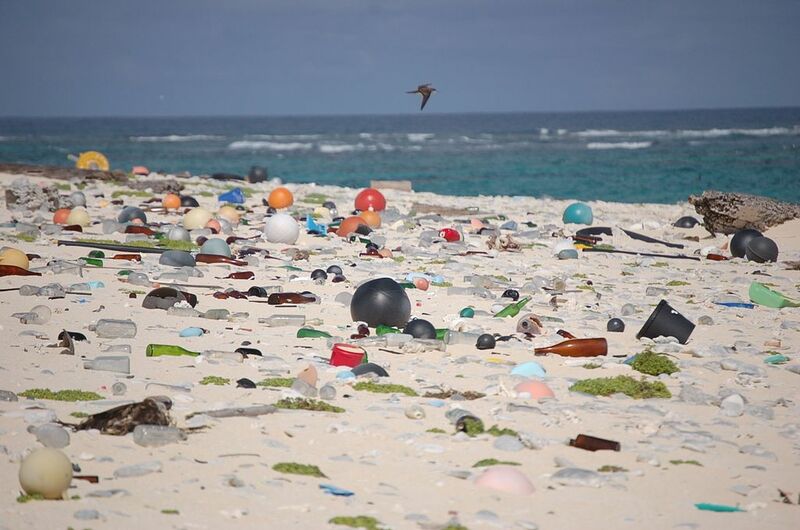 Henderson Island, a coral atoll in the South Pacific, midway between New Zealand and Chile, has the highest density of plastic debris anywhere in the world. Researchers found 38 million pieces of ocean plastic littering the island, with new items washing up every day. A man-made freak of nature, crabs were found living in plastic cosmetic pots. Even the Arctic isn’t safe. There are already five known garbage patches in our oceans, but now a sixth patch is in early formation in the Barents Sea, north of Norway and Russia. This increase in litter could be caused by growing populations in Northern Europe or melting Arctic ice that has led to more commercial shipping activity in the area. Given that litter density is higher on the Arctic seafloor than the surface, the scale of pollution is unseen and the impact unknown. Northern fulmars offer a barometer for ocean health, spending their life at sea and feeding in the ocean. 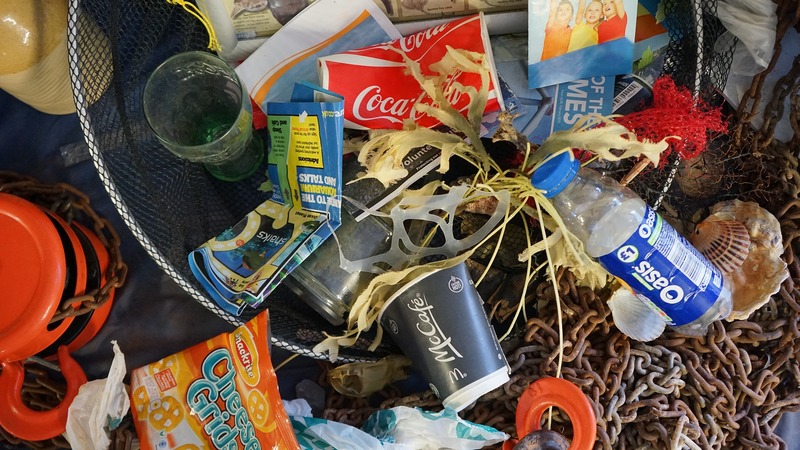 Plastic has been found in the stomachs of over 87 per cent of seabirds tested in studies. Although plastic doesn’t biodegrade, it is affected by sunlight, breaking into smaller pieces over time. Plastic floats on the sea surface or sinks to the seafloor, eaten by filter feeders such as baleen whales, some sharks, fish, and krill. Fragments also become tangled in seaweed on the tide line where shorebirds feed. Ocean plastic can look and smell like food, especially to seabirds that feed on krill, which feed on algae. Plastic fragments provide a surface for algae. Attracted to the algae by its sulphur smell, seabirds eat the plastic mistaking it for krill. Scientists predict that by 2050, 99 per cent of seabird species will be eating plastic. Seabirds mistakenly feed plastic fragments to their chicks causing them to die of starvation. Chris Jordan’s photographs of albatross corpses on Midway Atoll have become a global symbol of the ocean plastic tragedy. Turtles are deceived too, mistaking single-use plastic bags for jellyfish. Likewise, emaciated beached whales have been found with plastic bags filling their stomach. Marine animals also get caught in plastic packaging and either drown or suffer cuts and infection as their body grows. Turtles have been found with deformed shells or straws lodged in nasal cavities. Even coral, already dying from global warming, is attracted to eating plastic fragments containing chemicals that smell like food. Animals in entire food chains may be affected by ocean plastic, including us. Plastic microbeads in shower gels, facial scrubs and toothpaste, and plastic microfibres in clothing pose a less visible but no less harmful risk. According to a study funded by outdoor clothing manufacturer Patagonia, polyester fleece jackets release 1.7 grams of microfibres with each wash. These microfibres end up in the ocean. What is being done to reduce plastic waste? At the European Union’s Our Ocean conference last year, government, industry, business and conservation groups joined forces to discuss ocean health. Chile and Austria announced a plastic bag ban and Canada, France, Ireland, New Zealand and the UK will ban microbeads in self-care products. Microfibre debris could be more difficult to control. The Plastic Soup Foundation, an ocean conservation project funded by the European Union, says better quality clothing, fabrics coated with an anti-shed treatment, or a fibre-attracting device for washing machines could help. Incentivising manufacturers to find more sustainable packaging materials is ideal, but taxation that penalises manufacturers for unsustainable packaging is another option being considered in the UK where household recycling rates have fallen. Exporters could also face additional costs. European countries are considering legislation to charge higher fees on packaging that is hard to recycle. By designing eco-friendly packaging, businesses could save money in the long run. The Ellen Macarthur Foundation works with governments, businesses and academia to assist the change from the ‘take-make-dispose’ economy model to the circular economy model of recycling and reusing. European media company Sky is also raising awareness of the ocean plastic waste problem through their Sky Ocean Rescue campaign. Sky has engaged over six million people through their multi-media channels and a UK tour with a giant plastic whale. Made from 250 kilograms of single-use plastic picked up from beaches – the equivalent amount of plastic dumped in the oceans every second of every day – ’Plasticus’ toured thirteen cities in a campaign to raise awareness of the ocean plastic crisis and give advice on reducing plastic consumption. Sky has also pledged to remove single-use plastics from its operations, products and supply chain, and to create an Ocean Rescue Innovation Fund for technology to stop plastics entering the ocean. Artist and educator Angela Haseltine Pozzi doesn’t have a media platform on the scale of Sky, yet she has reached global audiences with Washed Ashore, an ocean pollution education project that transforms plastic waste into works of art to inspire consumer behaviour change. This innovative community project to save the sea was born when Angela decided to tackle the plastic debris on her local beaches in Oregon, USA. Since 2010, Washed Ashore volunteers have collected, cleaned and sorted 17,000 kilograms of debris from West Coach beaches. Angela takes months to research, design and create a sculpture, combining artistic flair with science. With exhibits displayed in locations such as the Smithsonian National Museum of Natural History, The Science Museum of Virginia and Audubon Aquarium, Angela wants to show the beauty of the natural world, as well as the horror of environmental damage. In her workshop, photographs lay alongside plastic as Pozzi recreates the animals being killed by the very same waste. 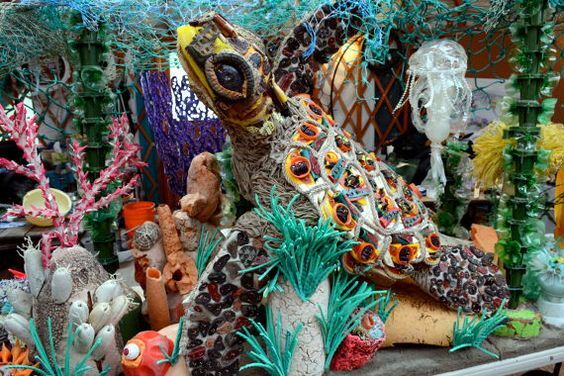 For the coral reef sculpture, a cracked Frisbee, plastic netting and frayed plastic rope are re-purposed into a bright orange sea jelly, food for Angela’s colourful hawksbill turtle. Crafted from a bucket, shoe soles, bottles and caps joined by wire, and a mottled plastic sheet for folds of skin, her turtle sculpture will end up tangled in a fishing net. “Turtle Ocean” shows both the beauty and vulnerability of ocean life. Individuals may believe they can’t make a difference but Indian lawyer Afroz Shah and his neighbour have set an inspirational example in their local community. Disturbed by the state of Versova Beach in Mumbai, Shah and his elderly friend started a beach clean-up in 2015. With sand buried under plastic waste, onlookers might have thought they were wasting their time. Today, a United Nations Champion of the Earth, Shah has many helpers for the world’s largest beach clean-up, which has removed over 5 million kilos of plastic waste so far. The difference his initiative has made shows what can be achieved with teamwork and commitment. Shah has seen a change of attitude locally. “The fishermen have become so active that they tick off anyone who tries to litter the sea or beach,” he told the India Times. Deterred by the volume of plastic waste in the past, local fishermen have realised, “if the entire fishing community of Versova comes together, there will be no more plastic in sight.” It is this spirit that Shah hopes to spread throughout India to make beach clean-ups a PAN India movement. Applying circular economy thinking, Shah also wants to see plastic waste converted to oil for fishermen’s boats or to energy pellets to provide a power source to industries. Plastic waste is not the problem of a single country, culture or industry. It is a problem created by societies that ignore the long-term impact of uncontrolled consumerism on human and environmental health. With the growing interest in sustainable business and greener lifestyles, our short-sighted approach is changing. By combining the disciplines of economics and ecology to guide policy, we can look forward to a more sustainable life on earth. Blue Planet II carried a stark warning, but David Attenborough believes we can stop environmental damage if we act now. Need inspiration on living a plastic-free life? Whether you’re just starting out or you’ve got your own tips to share, Lindsay Miles offers plenty of helpful advice and welcomes everyone to her zero waste blog Treading My Own Path. Search Twitter for #oceanplastic, #plasticfree, #zerowaste and #plasticfreejuly! Beach Litter by Susan White on Wikimedia.